Discover this exceptional whisky Hyde n°3 Single Grain 6 years old that has matured in Bourbon casks after a triple distillation in stills. This single grain irish whiskey has a lot of complexes and spicy Bourbon notes. It has been triple distilled in stills before being aged in first fill Bourbon barrels for 6 years. The Hyde family, from the same Douglas Hyde president line, continue the nagociation tradition for over 12 generations. 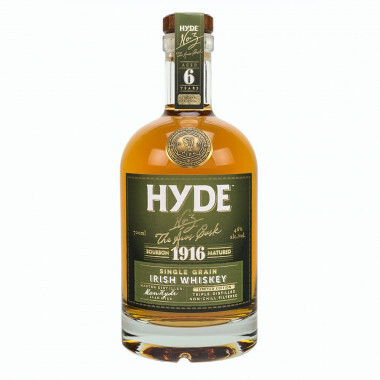 The double aging process on Hyde whiskeys is unique. Their quality is reconized world wide. Nose: sweet caramel notes hinted with cinnamon spices and cloves. Palate: spices and pepper continue on vanilla and woody notes. Finish: long and complex, it ends on a woody note.